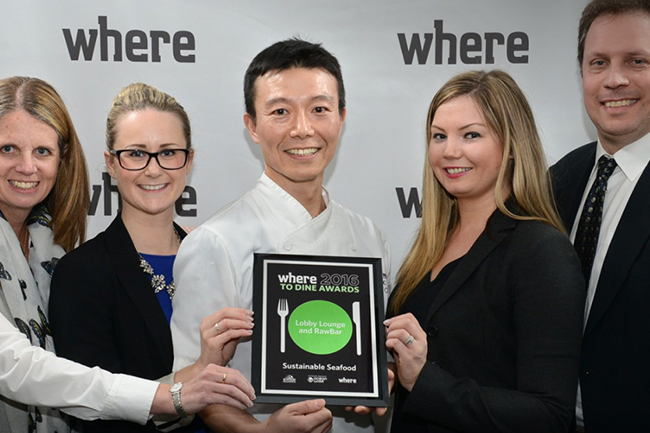 Fairmont Pacific Rim’s Lobby Lounge and RawBar was recently awarded the Where to Dine 2016, Vancouver Sustainable Seafood Award. Our menu has the Vancouver Aquarium’s seal of approval giving us bragging rights to being named Vancouver’s first 100% Ocean Wise sushi destination. Chef Taka’s authentic touches, modern flare and passion for sourcing and rolling only the best, make him a force to be reckoned with in Vancouver’s sushi scene. He sharpened his skills in Japan and Toronto before opening The Lobby Lounge. When Taka isn’t rolling and slicing in The Raw Bar, he shares his skills; teaching sushi classes with proceeds going to the Red Cross Relief Fund.